handcrafted modern and elegant vintage look. 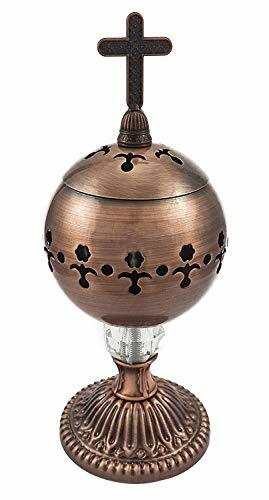 Made of 3 main parts, base round body, metal bowl and top cover with catholic crucifix , nice bronze finish, well made and functional., light weighted beautiful design with top cover to keep safely of the charcoal and prevent ashes to fall, used as decorative art piece, perfect incense burner for religious or meditation purpose. Please NOTE: the cross may arrive a bit loose, its done in order not to create pressure on the cross top during the shipment. SPIRITUAL AND BEAUTIFUL, handcrafted modern and elegant vintage look. Made of 3 main parts, base round body, metal bowl and top cover with catholic crucifix , nice bronze finish, well made and functional. MULTI-FUNCTIONAL, can easily burn cone/coil and charcoal, used for religious, meditation, relaxation purposes and as decorative church or home decor at living room, bedroom and outdoor. NO MESS, closed cross cover of the incense burner keeps safely on the coal and prevent ashes to fall. Easy to clean and empty, simply remove and empty the dish, after it has cooled. Perfect for everyday incense users. SIZE, height including cross 7.9" / 20cm, cross size 1.2" comes with Nazareth-store branded box to give your incense burner an extra protection against moisture and shipping transit. SAFELY CONSTRUCTED, polished metallic, alloy cover plated with brass unique design with acrylic clear handle, to pickup the burner while it burns.